"New PRX version for use with DevHook! Works with any emulated firmware version. Works with the new patched US disk and the original US and UK disks. Sorry, the patched UK disk is not currently supported." 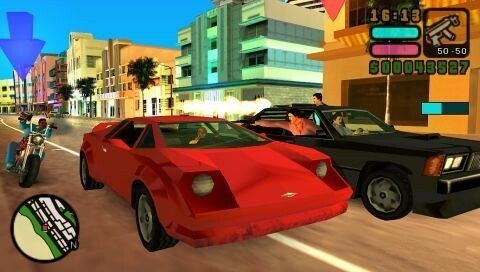 Vice City Multiplayer v0.3 has been released. Thanks to PSM magazine and gtapsp.com, we now know all the VCS multiplayer modes and details. Check my Vice City Stories page for all the info. Added /whois nick and /wi. This lets you see how long a player has been idle in the chat and also how long ago they connected. Debug registry key was still being deleted on exit (I accidentally used .DeleteKey instead of .DeleteValue). Please contact me, if you find any bugs. I patched Tiny Town and Face Off to remove the invulnerabilty powerup. Extract to GTA2\data. It won't replace your existing scripts, so you can still play the original with invul. Game comments are sent as a private message when a player tries to join your game. This means all versions will see the comments. "/QUIT msg" is supported. To prevent quit message spam, the server doesn't display a custom quit message if you only recently connected. Most GTA2 debug registry settings are now left alone (only skip frontend and script/map/style name are modified) - edit: oops I was wrong, it still deletes the debug registry key on exit. 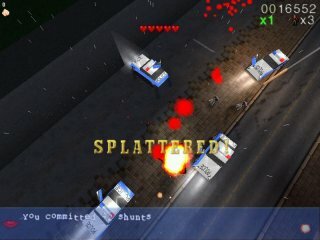 If you are one of the few who own a GP2X portable system then you might be interested in the GTA clone Payback. A playable demo has recently been released. IGN has a preview of some of the Vice City Stories multiplayer modes. As was already known, it will not support online/internet play. All the modes from Liberty City Stories are there and a few new ones. Some of the street races now require you to switch vehicle several times during the race. You could start in a car, switch to a boat, switch to a chopper and finally back to a car. One of the new multiplayer modes is called "Might of the Hunter" and involves the use of the Hunter helicopter to kill your opponents. The awards ceremony will take place at the Park Lane Hilton, London in the Grand Ballroom on Friday, October 27. Get your votes in now! "in game" status should be removed correctly now. Previously it was only removed for people currently in the channel and not new joiners. You can now easily test multiplayer maps in singleplayer. Some scripts will try to use commands on players 2-6, so they will crash. The "player is trying to join your game" message is now displayed no matter what version of GH the joiner is using. Join sound is only played if they are granted access to your game. Added a slightly more informative error message than index out of bounds. I forgot to include keep.ini, so when you hosted, the only map available on the GTA2 network screen was the one you selected in GH. GTA2online-best_player.wmv 19MB - Thanks to BIT and others. The 100 .mmp limit is no longer an issue. Install as many maps as you like. MMP files that you aren't using are moved to GTA2\data\tempMMP. Hamachi support. Auto launch Hamachi and join Hamachi networks. For hosting, you have to manually create Hamachi networks. There is now a status column for displaying away messsages. Type /away to set away or /back to set to normal. Comments can be displayed next to your hosted game. You could use it to display the game rules. If you have previously registered a name on irc.gtanet.com then you can type a password and identify. Admins can now teleport to places by right-clicking somewhere on the map. A short movie has been released that shows working trucks with trailers, train, helicopter, RC plane, molotovs and more. "As many eagle-eyed fans noticed from some recent pictures in the Picture Gallery, customisable synced license plates are now possible, and map creators can change player stats to suit the gameplay of the map." Check the MTA:SA blog for more info. 2006-10-01 - Gouranga.com updated - schu returns? Joystiq has confirmed that VCS PSP will not have infrastructure (online play). It will just have ad-hoc (local network play) like LCS. You will be able to use helicopters in multiplayer but that means nothing if you can't find anyone to play. Source: joystiq.com "Oh, and for the record, multiplayer is still limited to ad hoc play." Steven Day has released an update to his game finder. It's an open source multiplayer environment that supports GTA1, GTA:London, and Age of Empires 1 and 2. It's now possible to join games without opening any ports (host still needs 1 port open).